1917. All across Europe, while men face a last-ditch battle in the mud of the trenches, colorful biplanes fly in the foggy sky, gallantly fighting each other as true ‘knights of the air’. 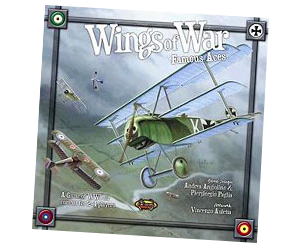 Elegant, easy to learn and played only with cards, Wings of War (now called Wings of Glory and published by Ares Games) nevertheless manages to capture the feel of WWI dogfighting. There are several sets available; this rules summary includes the basic rules and the Altitude, Ground Fire and Balloon rules from the set Burning Drachens (note that the system has been repackaged now that Ares Games is publishing). Wings of War and its many expansions may not recreate specific air battles—though I’m sure that is quite possible—but for any fan of airplane design history, this game is a must. The rules are simple and fun, and the game is great out of the box, but to get the most of it your really need to get yourself some of the stunning airplane miniatures. There’s a continually growing range of this accurately modelled and painted miniatures, and flying them around a tabletop is huge fun. You can even buy large mats to give you a suitably attractive surface of fields to fly over. It’s certainly possible! I’ll see what I can do. Another request for “Wings Of Glory”! Thanks for you work. I use these. and they work great! Sorry folks, I had a look at this, but because the rulebook PDF is low res and password-protected, I can’t reproduce the new icons and counters without purchasing a copy of the game. Since I already have the old version, I’ve got no immediate plans to buy the new one – so I can’t update this summary in the near future.